Cures for both type 1 diabetes and type 2 diabetes have not yet been discovered, but progress is being made to prospectively cure type 1 diabetes in this generation. As studies continue, the root causes and mechanism behind both forms of the disease are becoming more clearly understood all the time. People with type 2 diabetes can go into remission, but while a cure is still elusive for type 1 diabetes, research from major angles is contributing towards a potential cure. Researchers are beginning to get excited again that a cure or near-cure treatment could come as early as within the next decade or two. A diabetes vaccine diabetes vaccine is consistently being investigated to provide a true biological cure for type 1 diabetes. The aim is for a vaccine to be created that stops the immune system from attacking the body's insulin-producing beta cells. Another cure prospect gaining momentum is islet cell encapsulation, with stem cells used to create insulin-producing cells that can work without immune system interference. Research into a diabetes vaccine is being made on several fronts, with Selecta Bioscience, a clinical bioscience company, developing a Synthetic Vaccine Particle (SVP) as an immunotherapy for type 1 diabetes. The vaccine is expected to reprogram the immune system to prevent inflammatory responses to insulin cells, with Selecta currently trialling SVP on mice courtesy of funding from JRDF, a leading global organisation funding type 1 diabetes research. Elsewhere, the Faustman Lab at Massachusetts General Hospital is currently leading a human clinical trial program to test the efficiency of their Bacillus-Calmette-Guerin (BCG) vaccine. Positive results have already been reported from their Phase I study. An arthritis drug, abatacept, has also shown it can delay type 1 diabetes progression a year after treatment has been discontinued, with studies again funded as part of JRDF’s Restoration program. In October 2014, the first person with diabetes was implanted with an islet cell encapsulation system, with insulin-producing cells injected into the body and protected from destruction by the immune system. Further trials are currently in progress to test its safety among participants with type 1 diabetes, with this treatment set to allow patients to produce their own insulin automatically. Islet cells are derived from stem cells, the foundation for another advancement made by Harvard University, who have used them to create large quantities of insulin-producing beta cells. The Harvard team have been able to manufacture the millions of beta cells necessary for human transplantation, and trials could take place within a matter of years. In the meantime, the need for patients to take immunosuppressive drugs and insulin is unavoidable, but a cure for type 1 diabetes is more within reach than ever before. Should ongoing trials prove successful in negating insulin dependence, with no side effects or issues with safety, an end to type 1 diabetes could yet be discovered. Clinical resolution or remission of type 2 diabetes is a rare but identified medical phenomenon. Type 2 diabetes may go into remission either through dietary and fitness measures, or in some cases through gastric bypass surgery. However, this isn’t the case for all type 2 diabetes patients and needs further research before clear conclusions can be drawn. Remissions may not be considered a cure, however, but it may mean type 2 diabetes patients can stop taking medication. Studies have previously researched whether a very low calorie diet could allow people with type 2 diabetes to shed levels of fat in the pancreas and liver. Consuming 600 calories a day could subsequently reverse, or even eliminate insulin resistance. This study is to be expanded on by Diabetes UK, who are funding a research project to see if a very low calorie liquid diet and assisted weight management can send type 2 diabetes into remission in the long-term. Many of us are holding out for a cure for diabetes to be announced. There is yet to be a cure for diabetes but research is making gradual progress in certain areas. In this video we will look at some of the avenues which researchers are currently exploring. Islet cell transplants are the perhaps the closest we’ve come to a cure for type 1 diabetes so far. 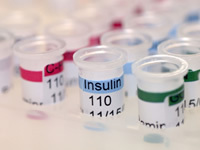 Islet cell transplants involve injecting insulin producing islet cells into the body. Transplantation has helped people to significantly reduce insulin dosage requirements. However, the benefits of transplantation tail off with time and people need to take quite powerful anti-immune drugs to prevent the body attacking the transplanted cells. Transplanting exogenous beta cells is another form of potential cure that has been attempted, both amongst mice and humans. However, similar to transplant procedures, this has provoked a strong reaction from the immune system, which attacks the transplanted tissue. Other cell transplant procedures have been attempted, including stem cell research for both type 1 and type 2 diabetes. In most cases, the same mechanism that destroys beta cells in the first instance attacks stem cells. Stem cell research is a rapidly growing area of research that is uncovering important new avenues of study each year. Stem cell research has the potential to uncover new ways of treating both types of diabetes. Stem cell research has been particularly effective in uncovering a new understanding of type 1 diabetes. Another possible cure may one day come from the microscopic, nanotechnological spectrum. In this instance, tiny insulin implants could meter out insulin to blood glucose levels as and when it is required. This type of cure is theoretically possible, and several scientists are working towards this future. However, as with other forms of potential diabetes cure, this remains only a distant potential. Discoveries that may one day contribute to a diabetes cure do occur often, however. Be it better understanding of the immune system or discoveries in the natural world, advancement towards a diabetes cure may one day be possible. However, at this stage a diabetes cure remains impossible. Please check the Diabetes News for updates on potential diabetes cures and news of research on similar areas.